Thida, W., et al. Review on Outcome of Pregnancy of Unknown Location and Further Management – A Retrospective Study. (2017) J Gynecol Neonatal Biol 2(2): 46-49. © 2017 Thida, W. This is an Open access article distributed under the terms of Creative Commons Attribution 4.0 International License. Aims: The study aimed to review the outcomes of pregnancy of unknown location (PUL) in EPAU at Yeovil District Hospital and determine the PUL rate and correlate the serial beta hCG with the predicted outcome and review the further management. Methods: A retrospective study over a year period reviewing the cases diagnosed as PUL between 1st November 2014 to 31st October 2015. Those patients between 6 and 15 weeks turning up at EPAC for the 1st visit were included and those patients less than 6 weeks and those for rescans were excluded. Results: The total number of pelvic scans done in EPAC unit at YDH during the study period was 1093. The total number of PUL cases was 96 giving the PUL rate of 9%. Of all the PUL patients the most common outcome was Failing pregnancy (53%) and the ectopic pregnancy rate was 9%. PUL patients that ended up with ectopic pregnancy (11%) behave like Intrauterine pregnancy (IUP). Among those PUL ended up with IUP, 21 % had suboptimal changes in serial beta hCG. Conclusions: PUL rate in our unit is 9% which is similar to the reported rate in the literature. The predicted outcomes like failing pregnancy, ectopic pregnancy, IUP and persistent PUL are comparable to those reported in the literature. Majority of outcome of PUL is not ectopic. Further management for each outcome of PUL should be based upon good history taking, clinical assessments, haemodynamic stability and patient’s informed choices. Pregnancy of Unknown Location (PUL) is a positive pregnancy test in a patient where there is no evidence of intra uterine or extra uterine pregnancy on a transvaginal ultrasound scan. In Early Pregnancy Unit (EPAU) at first visit it may not be possible to confirm extra uterine or intra uterine pregnancy is 8 to 31%. At special scanning unit the PUL rate is 8 - 10%. 48 hour serial beta hCG measurement plays a role in predicting the outcome of PUL. The possible clinical outcome of PUL are failing PUL (44 - 69%), intrauterine pregnancy (30 - 37%), and ectopic pregnancy (8.1 to 42.8% at EPAU and 8 - 14% at Special Scanning Unit). There is no consensus on the further management yet. An expectant approach to the management of PUL has been demonstrated to be safe. A small percentage of PUL is ectopic. However the challenge in the current clinical practice is the workload of follow up with hormonal measurement, repeating pelvic scans and intervention like laparoscopy or Evacuation of Retained Product of Conception (ERPC) to exclude the possibility of ectopic pregnancy. This is a retrospective study over a period of one year reviewing on cases diagnosed as PUL in Early pregnancy unit from 1st November 2014 to 31st October 2015 at Yeovil District Hospital (YDH). Inclusion criteria include those patients between 6 and 15 weeks where pregnancy test was positive and turned up at EPAU for the 1st visit. Patient’s data at EPAU register and blood and histology reports and USS View point were reviewed. Exclusion criteria includes those patients with pregnancy test positive less than 6 weeks, and those who need rescans for other reasons. Pro forma was done for data collection. Data were analyzed electronically as well as manually. All the patient diagnosed as PUL at scanning underwent 48 hour serial beta hCG measurement. This measurement play a major role in Management of PUL based upon the interpretation on 48 hour beta hCG trend in predicting the outcome of PUL in each individual case. 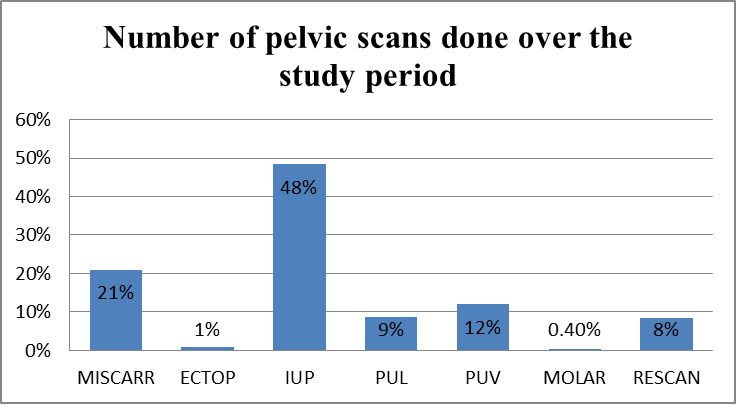 Figure 1: Number of pelvic scans done over the study period. Serial beta hCG pattern in correlation with each clinical outcome is shown in Figure 2. Figure 2: Beta HCG treand in each clinical outcome of PUL. The clinical outcomes of PUL are shown in Figure 3. 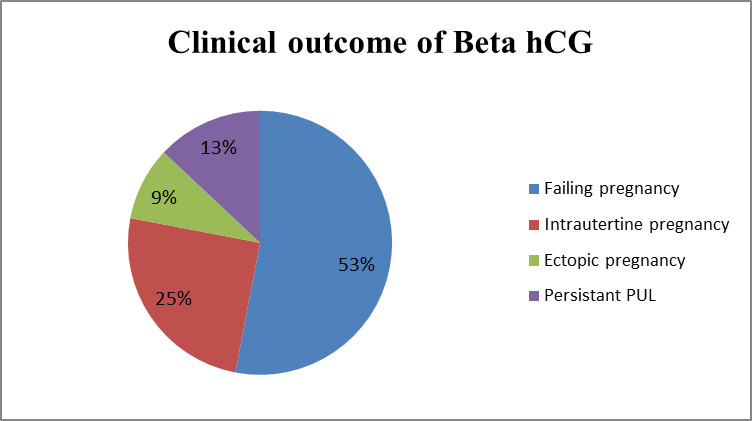 Figure 3: Clinical outcome of Beta hCG. The most common clinical outcome in PUL patients was miscarriage (53%). The others were intrauterine pregnancy (38%), intrauterine pregnancy (25%) and ectopic pregnancy (9%). Among those PUL patients who were found to have intrauterine pregnancy, 79% had a rise of beta hCG greater than 63 % over 48 hours and 21% had sub optimal changes in beta hCG. (Figure 2) When they were followed up to confirm viability with further pelvic scanning, those with suboptimal changes had 2 more pelvic scans to confirm viability while those with a rise of 63% had only one pelvic scan. In the group of PUL patients who had miscarriage, 60 % had a decrease in their beta hCG greater than 50% over 48 hours. 14% in between 15 - 50%. 22% had suboptimal rise over 48 hours. Only 4% of them had a rise greater than 63% over 48 hours. According to PUL patients who had miscarriage with beta hCG falling greater than 50%. 68% could be discharged from clinic with the advice to repeat urine pregnancy test after 2 weeks. 29% of them needed conservative management with further beta hCG measurement and 3% needed surgical intervention with Evacuation of Retained Product of Conception (ERPC). Those whose beta hCG fell between 15 - 50%: 72% needed conservative management with further beta hCG measurement. 14% needed surgical intervention ERPC, and 14% were discharged with the advice to repeat urine pregnancy test after 2 weeks. According to PUL patients who had ectopic pregnancy, 89% had sub optimal changes in beta hCG and 11% had a greater than 63% rise over 48 hours. In the case of PUL patient who had ectopic pregnancy 67% had further management by laparoscopic surgery, 22% had medical management with methotrexate injection and 11% were given conservative management with further beta hCG until normal level. In the case of suboptimal changes under 500 IU/L of beta hCG, 13 % had persistent PUL based upon further serial beta hCG (figure 3). In these PUL patients with low level of beta HCG and no symptoms, 67% were given methotrexate injection and 33% were followed up with further beta hCG measurement until the level was reached back to normal. PUL rate in our unit is 9% which is similar to the reported PUL rate in the literature[2,11]. The prevalence of PUL is determined by the quality of ultrasound scanning. The higher the quality of scanning, the better the chance to detect the ectopic pregnancy and minimize the number of PUL and consequences of unnecessary workload for the unit. According to the international society of ultrasound in Obstetrics and Gynaecology 2006, the PUL rate should be less than 15%. In this review, the predicted outcome based upon the serial beta hCG measurement are comparable to those reported in the literature[2,11]. In our EPAU, we use serial beta hCG in prediction the outcome of PUL according to NICE guideline 2012 on early pregnancy and miscarriage. The single measurement of progesterone level has been introduced in some EPAU to predict the outcome of PUL in addition to serial beta hCG measurements. According to a meta analysis, serum progesterone level is good in predicting the viability of pregnancy but its discriminative capacity is insufficient to diagnose ectopic pregnancy with certainty. Hence NICE guidelines 2012 recommend not to use serum progesterone measurements as an adjunct to diagnose either viable intrauterine pregnancy or ectopic pregnancy. 48 hour serial beta hCG measurement plays a role in predicting the outcome of PUL. There has been various studies to look into the trend of the beta hCG over 48 hours in predicting the outcome of PUL. Kadar et al. were the first to describe the minimal increase rate of 66% over 2 days for an IUP. Although a doubling of hCG is often expected in 48 hours, this varies with gestation: as pregnancy progresses, doubling time lengthens. Intervention for an hCG rise of less than 66% over 2 days, a practice supported by previous data, would potentially result in the interruption of viable pregnancies[12,13]. The most recent studies show minimize rise of hCG for a viable IUP to be 53% to minimize unnecessary intervention. In clinical practice, a more conservative rise of 35% over 48 hours is suggested to minimize the potential risk of terminating a wanted pregnancy. NICE 2012 recommend that if the rise of beta hCG is 63% over 48 hours, we should inform woman that she is likely to have a developing an intrauterine pregnancy (although the possibility of ectopic pregnancy cannot be excluded). In this study, 21% of PUL patients with IUP had suboptimal rise. If we decided upon that suboptimal changes group as having ectopic pregnancy there would be the risk of an unnecessary intervention for ectopic pregnancy as well as ending of viable pregnancy Hence there would be benefit to do another measurement of beta hCG or repeat TV scan to confirm possible IUP in those who are haemodynamically stable and who want to continue the pregnancy. Decline rate of serum beta hCG concentration has been described in failing PUL. Failing PUL include both extra uterine pregnancy as well as intra uterine pregnancy which are too early to be seen on the initial Trans Vaginal (TV) scan. One study stated decline rate is dependent on the initial serum hCG (more rapid decline was associated with a higher starting concentration) and rate of decrease was 21 - 35% at 2 days. Another study stated that decrease in hCG more than 13% or hCG ratio less than 0.87 (hCG 48 hours/hCG 0 hour) (sensitivity of 93% and specificity of 97%) is found to be the optimal ratio for predicting failing PUL. In our study, the decline of serum beta hCG greater than 50% over 48 hours is used for cut off value for failing pregnancy based upon the NICE guideline. In the group of failing pregnancy, about 60% of PUL patients had this decline rate of greater than 50%. It was found that those with 50% fall in beta hCG needed less surgical intervention (only 3%) compared to those whose beta hCG fall in between 15 - 50%. (14% needed surgical intervention) In those with 50% fall group, more than two third patient could be sent home with an advice to check urine pregnancy test in 2 weeks. For those with beta hCG fall between 15 - 50%, follow up further measurement of beta hCG was needed in more than two third of cases. This shows that conservative management with further beta hCG measurement is safe in PUL and can avoid unnecessary intervention but unfortunately multiple visits and increase in workload to repeat beta hCG measurement are necessary until a diagnosis is reached and the patient can be safely discharged. When the rise or the fall in hCG is suboptimal, the most likely outcome is ectopic pregnancy. Approximately 71% of women with ectopic pregnancy have a rise in hCG that is slower than the minimal rise for a viable pregnancy or a decline that is slower than the minimal rate of fall in spontaneous miscarriage. One study reported that a suboptimal rise in serum hCG predicts ectopic pregnancy with a positive predictive value of 43.5%. Another study reported that 15 - 20% of ectopic will behave like IUP having doubling serum hCG level over 48 hours. In addition, 8% of ectopic pregnancies have a fall in hCG similar to spontaneous miscarriage. In our study, it was found out that 11% behaves like IUP with doubling beta hCG and the rest have suboptimal changes. Therefore it needs to be cautious to avoid the risk of missing the diagnosis of ectopic pregnancy as 15 - 20% of ectopic will behave like IUP. Considering the treatment for ectopic pregnancy, about two third of PUL patients with ectopic pregnancy needed laparoscopic surgery and 22% of them needed medical treatment with Methotrexate injection and the rest were followed up with further measurement of beta hCG. There is an ongoing randomized controlled trial that will provide guidance on the present management dilemmas in women with PULs with low and plateauing serum hCG concentrations (METEX study: methotrexate versus expectant management in women with ectopic pregnancy) study. Persisting PULs are defined as those in which the serum hCG levels fail to decline, there is no evidence of trophoblastic disease and the location of pregnancy cannot be identified using transvaginal ultrasound or laparoscopy. Usually, the serum levels of hCG are low ( < 500/l IU/L) and have reached a plateau. Patients with PUL and plateauing serum hCG levels are commonly treated with systemic methotrexate (MTX). The ongoing METEX study aim to find out whether expectant management is an alternative to MTX treatment in terms of treatment success, future pregnancy, health related quality of life and costs. In our study, 0.4% were categorized under persistent PUL cases where our unit use methotrexate injection treatment in about two third of cases and only one third were given conservative management with further beta hCG measurement. The majority of outcome of PUL is not ectopic. In our study, the rate of ectopic pregnancy in PUL patients is only 9% which is comparable to literature. Expectant management is shown to be safe and to reduce the need for unnecessary surgical intervention with no serious adverse outcomes and to avoid the unnecessary termination of viable pregnancy. But ultimately it is associated with increased workload for further blood test for beta hCG and repeat pelvic scans and multiple follow ups that increases the anxiety to the patients. Outcome prediction should not only consider the serial beta hCG trend with recommended cut off value but also take into account little exception to avoid misdiagnosis of ectopic pregnancy as well as a viable pregnancy. Generally, so long as patient is haemodynamically stable, further management of PUL could be expectant management. Surgical intervention should be considered only in those with haemodynamically unstable condition and high suspicion for ectopic pregnancy. Further management for each outcome of PUL is based upon good history, clinical examination, haemodynamic stability and patient’s informed choices and should not be solely on the basis of doubling time of beta hCG. 1. Ectopic pregnancy and miscarriage: diagnosis and initial management. (2012) NICE guidelines [CG154]. 2. Sagili, H., Mohamed, K. Pregnancy of unknown location; an evidence-based approach to management. (2008) The Obstetrician & Gynaecologist 10(4): 224-230. 3. Kadar, N., DeVore, G., Romero, R. Discriminatory hCG zone: its use in the sonographic evaluation for ectopic pregnancy. (1981) Obstet Gynecol 58(2): 156-161. 4. Condous, G., Lu, C., Van Huffel, S., et al. Human chorionic gonadotrophin and progesterone levels in pregnancies of unknown location. (2004) Int J Gynaecol Obstet 86(3): 351-357. 5. Mol, B.W., Lijmer, J.G., Ankum, W., et al. The accuracy of single serum progesterone measurement in the diagnosis of ectopic pregnancy: a meta-analysis. (1998) Hum Reprod 13(11): 3220-3227. 6. Barnhart, K.T., Sammel, M.D., Rinaudo, P.F., et al. Symptomatic patients with an early viable intrauterine pregnancy: HCG curves redefined. (2004) Obstet Gynecol 104(1): 50-55. 7. Seeber, B.E., Sammel, M.D., Guo, W., et al. Application of redefined human chorionic gonadotropin curves for the diagnosis of women at risk for ectopic pregnancy. (2006) Fertil Steril 86(2): 454-459. 8. Barnhart, K., Sammel, M.D., Chung, K., et al. Decline of serum human chorionic gonadotropin and spontaneous complete abortion: defining the normal curve. (2004) Obstet Gynecol 104(5 Pt 1): 975-981. 9. Condous, G., Kirk, E., Van Calster, B., et al. Failing pregnancies of unknown location: a prospective evaluation of the human chorionic gonadotrophin ratio. (2006) BJOG 113(3): 521-527. 10. Silva, C., Sammel, M.D., Zhou, L., et al. Human chorionic gonadotrophin profile for women with ectopic pregnancy. (2006) Obstet Gynecol 107(3): 605-610. 11. Emma, K., Tom, B. Predicting Outcomes in Pregnancies of Unknown Location. (2008) Women's Health 4(5): 491-499. 12. Kadar, N., Freedman, M., Zacher, M. Further observations on the doubling time of human chorionic gonadotropin in early asymptomatic pregnancies. (1990) Fertil Steril 54(5): 783-787. 13. Fritz, M.A., Guo, S.M. Doubling time of human chorionic gonadotropin (hCG) in early normal pregnancy: relationship to hCG concentration and gestational age. (1987) Fertil Steril 47(4): 584-589. 14. Seeber, B.E., Barnhart, K.T. Suspected ectopic pregnancy. (2006) Obstet Gynecol 107(2 Pt 1): 399-413. 15. Condous, G., Okaro, E., Khalid, A., et al. Role of biochemical and ultrasonographic indices in the management of pregnancies of unknown location. (2002) Ultrasound Obstet Gynaecol 20(Suppl 1): 36-37. 16. Seeber, B.E., Sammel, M.D., Guo, W., et al. Application of redefined human chorionic gonadotropin curves for the diagnosis of women at risk for ectopic pregnancy. (2006) Fertil Steril 86(2): 454-459. 17. Van Mello, N.M., Mol, F., Adriaanse, A.H., et al. The METEX study: methotrexate versus expectant management in women with ectopic pregnancy: a randomised controlled trial. (2008) BMC Women's Health 8: 10.